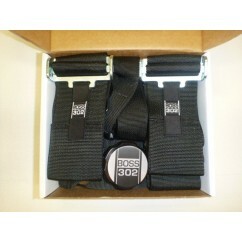 Cool Tech LLC is very excited to announce the availability of this front and rear Tow Hook Kit for the Boss 302 Mustang. In fact, the kit will work with all S197 Mustangs from 2005 thru 2014. There are at least a couple of reasons why you may want to consider this kit. First, many road course tracks across the Country are increasingly requiring some kind of tow hook provision. The issue is that in the event of a mishap or breakdown, the track crew wants to have the ability to tow your car off the track as efficiently as possible AND without causing any additional damage. Another reason for the kit is in the case of an on-road accident or breakdown. Most of our mustangs are low to the ground and many employ some kind of front splitter. In the unfortunate event that it becomes necessary to load your Mustang onto a flatbed tow truck, then this loading process becomes far easier with our tow hook kit. Pop the (included) plastic cover off, screw in your tow hook, and you are ready to be pulled! The alternative (no tow hook), you are at the mercy of the skills of the tow truck driver and/or the orientation of your car. Most european cars and many japanese car have an OEM provision of a tow hook. Unfortunately, and presumably due to cost, Ford did not include either a front or rear tow hook on the mustangs. Here at Cool Tech, we designed the kit that we thought the factory would. Our kits attach to the vehicle directly at the end of the frame rails - virtually the strongest part of the car - especially for linear pulling strength. The second OEM-like design element is that opted to create heavy-duty threaded steel sleeves. In fact, we intentionally selected the same thread pattern as chosen by BMW. In doing so, we are assured of the design strength of the threads under severe linear pulling loads and we allow the owner to optionally use any BMW-compatible tow hook. 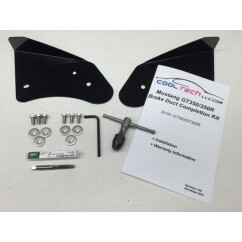 This is a "combo" package price comprised of both our front & rear tow hook kits. Each kit will includes the mounting plates, all necessary hardware, instructuctions, plastic (paintable) plugs, and two tow hooks. Note: There is NO welding. The kit and included instructions are targetted for the owner to install with ordinary tools. The front and rear plates (hidden) will have a durable, fine grain black wrinkle powdercoating. The mounting hardware is stainless steel. Quality Materials - Steel powdercoated components. Fully Finished! - Choose red or blue annodized tow hooks.